This paper deals with a family of dynamic game models that represent schematically the interaction between groups of countries in achieving the necessary limitation of carbon atmospheric emissions in order to control climate change. We start from a situation where m coalitions of countries exist and behave as m players in a game of sharing a global emission budget through the establishment of an international emissions trading system. We characterize the Nash equilibrium solutions for this game in a deterministic context. Through a simple replication schemes, we increase the number of players, each one becoming infinitesimal, and we characterize the limit games thus obtained. 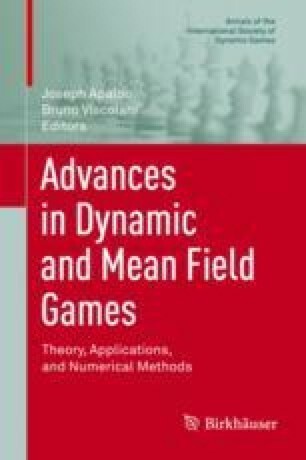 A stochastic version is proposed for this class of models, and the limit games are characterized, using the recently defined concept of mean field games. This research has been supported by the Natural Sciences and Engineering Research Council of Canada (O. Bahn and R. Malhamé).